I just finished watching the new Magic and Bird documentary on HBO. I had been looking forward to the premiere of Winning Time: Reggie Miller vs. the New York Knicks on Sunday evening and had forgotten that a new Bird and Magic documentary was floating around. The Bird/Magic story is obviously one of the most well known and well documented stories (maybe even any story) in the history of sports. It has always been so interesting because you have timeless stories and themes so readily at hand: black against white; workaday values against Hollywood fame; East vs. West; an intensely private figure against one who was admired and revered for his warmth. The fact that these two players played for the two most iconic franchises in the NBA was only icing on the cake. And, you also have the fact that they were doppelgangers – two guys who were about the same height, who traditionally (Magic played every position, but mainly point, and no one his size had ever done that) played the same position. They were both excellent passers and they played with an appreciation for the game itself; a game that is based on the giving to others, the unselfishness that spurs on success in basketball – although TV and sneaker deals and the beauty of a drive and dunk through the lane always seem to tell us differently. All of this was already known about Bird and Magic. However, what struck me most about this documentary was how affected I was by watching it. This is a story that I had pored over for years. 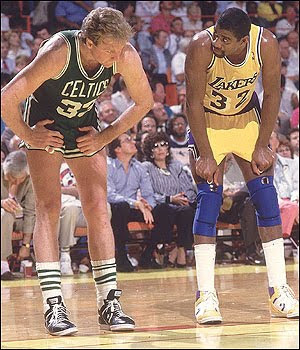 I can’t count how many summers I went to basketball camp and sat in the dark after lunch with my fellow campers watching Magic Johnson and Larry Bird highlight videos. We heard the stories of Magic working on his last minute shot on every morning before school; we knew about Larry’s uncanny knack for the game and his hailing from not only the heartland of America, but also the heartland of basketball. But tonight – at twenty-four – from watching this documentary, I realized how much basketball actually means to me. I played basketball throughout my youth and up through high school. I wasn’t gifted at the sport, but I was good enough. I was even a captain on certain teams because I ran well and played defense and could deliver a well-placed bounce pass. I never felt the game within me. I never felt its extension as an immediate and serious part of myself – the natural extension of the arm and hand for a one armed bounce pass; the immediate throw of the perfect outlet; the timing for a wrap around pass; or the grace and body control to absorb contact on a reverse lay-up for three points the old fashioned way. That is to say, the game was not my solace. I could play it. I had flashes of youthful brilliance, when at eight years old, I would play three on one against three other nine and ten year olds in my neighborhood. However, at the critical point in my relation to the game, there was no immediacy – the game did not give me sanctuary and it did not move my soul. Now, as I was saying, it is different. All of this writing I have done here about basketball only opened up the understanding that came tonight. This understanding came because I am twenty four with a wealth of optimism and enthusiasm for the world and, like most, I hate my job and I see the very obvious forces against my desire to create and make an art for others in this world. So, for the first time I truly need basketball. I need to go to the local court and play pickup ball with high school kids. I need this because I see how they need the game and how they love the game. On the court, when I am “the whitest (expletive) in the gym,” I can at least run and push that ball and try to draw contact and finish with a fingeroll. And then, afterwards, I can smell the asphalt and worn rubber on my hands and I can drink a beer. It is my solace. I just read recently that the latter day MJ was different in his relation to the game because at that point in his life, the court was his sanctuary. He was the best because he lived in basketball. It was his extension, the place he was natural. However, Larry and Magic were before Michael and I (had to put myself in a sentence with those three names). They played the game with a certain perfection – instinctually – that Michael worked harder than anybody to attain. Michael was natural in the way his body was made for the game and his mind was natural because it was made for being the best. But Larry and Magic’s minds were made for basketball. They know “The Secret” as Bill Simmons as recently expanded upon in The Book of Basketball. “The Secret” is making others better. The secret is finding your role and fitting in it. Finding your role makes for the success of others. You excel when you need to and you supplement when you need to. It’s that simple. Perhaps what I felt so strongly and so surprisingly was how much this single truth affected me. I love basketball (obviously) and I have seen tapes of Magic and Bird playing so many times. Yet, tonight, I saw the perfection in their passes and their movement, their understanding of the game. They were men and perhaps their success garnered more riches than I can know, but in the end, they were men and could find a place to hang their hat in this world. They found a way to bring success to themselves and to others by finding their roles, by helping others fit into their roles. And by doing both of these things, they found a sanctuary. We are all like Bird and Magic. We are all trying to find our sanctuaries no matter what risks we take or rewards we seek. As much as I finally can appreciate my love for basketball and the solace I can take in the bounce of the ball on the court; in the squeaking of my sneakers from end-line to end-line; in the rush of a steal at the top of the key and the ensuing breakaway lay-up to inspire your pickup team. However, the court is not my place of sanctuary – it is not my role. My role may very well be the words I write, or it could be something else entirely unknown to me. All that is important is that we can recognize beauty, passion and perfection when we see it and that that recognition causes us to reach for the same deep feelings and ability in ourselves, no matter where it is or where we may find it. Celtics vs. Lakers is the greatest basketball rivalry for a reason.